TRU’s website advertises “outstanding athletic facilities,” boasting student access to the indoor pool, a running track and a gymnasium with weight rooms as well as racquetball and squash courts. 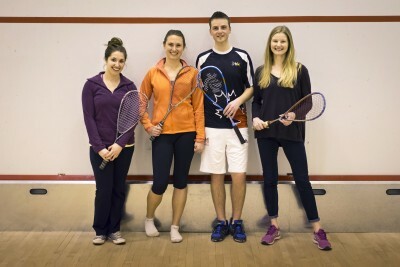 The TRU Squash Club students, however, have to use No Limits Fitness on the North Shore to play because the advertised squash courts are being used for other purposes. With around 150 signatures from students who wanted to play squash, the president of the TRUSU Squash Club and former competitive squash player Nick James said he had tried to reason with the athletics department to clear the squash courts to no avail. “I took that to the school and said there are 150 people who want to play squash on campus, can we reopen the squash courts and the athletics department told me they didn’t want to have to find room in their budget and they just didn’t want to move their stuff,” he said. Ken Olynyk, TRU’s Director of Athletics and Recreation, made the initial decision to close the squash courts and made it clear that the courts are not being used for storage. “Storage is a little bit of a misnomer because it’s used for our summer sports camps. So it’s an office for summer sports camps, we operate out of there and the other one is used by Physical Education as a training lab. That’s what they’re being used for now and for the foreseeable future,” Olynyk said. James adds that he has tried different strategies to try and get athletics to reconsider. “I figured out a way to use the court to generate money – enough money for the storage. I emailed them to meet with them again and they stopped responding to emails, were unavailable to meet, basically kind of just shut the door on us,” James said. According to Olynyk, the meetings that took place about a year ago didn’t end abruptly without communication, but rather after a final decision was made. Due to the lack of facilities on campus, students have to travel to the North Shore if they want to play squash. James said there is a big difference in the number of members in comparison to active players of the location. “The reason there’s such a big difference between the amount of people in it and the amount of people that are active because is because it’s on the North Shore. There’s no facility near campus, a lot of students don’t have cars…the transit system is not reliable,” he said. 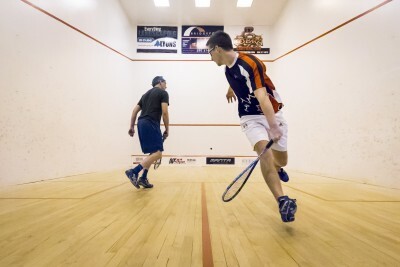 However, approximately 50 students have gone to the North Shore to be taught to play squash by James this semester. “That many people are willing to go to the North Shore to play. How successful do you think it would be if we just had courts here?” he said. James said there were lots of international students coming from countries where squash was a popular sport played during school. “The people in charge of TRU don’t know that. They’re not aware of it or they don’t get it…but they won’t accommodate us,” he said. James said the club was purely recreational with their first tournament held last weekend at the No Limits gym. James hopes that with more students joining the club, the athletics department will take notice and make the courts available. “I just want them to tell me a good reason. If it didn’t economically make sense, or they wanted to try a different direction, something other than ‘I don’t have room in my budget’ you know…that’s not a good answer,” James said. Olynyk said that when the initial decision to close the courts was made there were a lot of other options for playing squash around Kamloops. “There were a lot of reasons. We had 11 squash courts across the street, there were other squash facilities around the city and at that time we didn’t feel it was a necessity for us to provide that opportunity,” Olynyk said. Squash Club member and TRU student, Kristjan Thorsteinson, said it was a shame that the two squash courts were not being used. “It’s a really cheap and easy sport for students to play and it’s good for your health,” he said. Olynyk said that the athletics department hasn’t ruled out the possibility of squash courts being available on campus in the future, but that available space is tight at the moment.